Welcome to the Loveland InterFaith Effort, LIFE Food Pantry in Loveland Ohio. We are closed Saturday, January 12th due to expected snow accumulation. 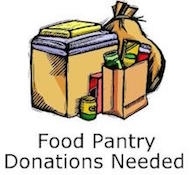 food, financial assistance, and services to needy residents within the Loveland School District and to members of our supporting congregations, who qualify under Federal guidelines for persons in need encouraging self-sufficiency in individuals and families. 101 South Lebanon Road in Loveland, Ohio 45140. Enter the double glass doors of the Parish Life Center. *Clients include the elderly, disabled, children and working families. *We serve over 500 people each month from a facility no bigger than most peoples kitchens! Pantry closed 1/31/19 The Pantry is closed Thursday, January 31, 2019 due to weather. Stay home, stay warm and be safe!